Chattanooga is one of the country’s premier outdoor destinations, with rock climbing, mountain biking, trail running, whitewater rafting, and hiking all within easily accessible from the city. 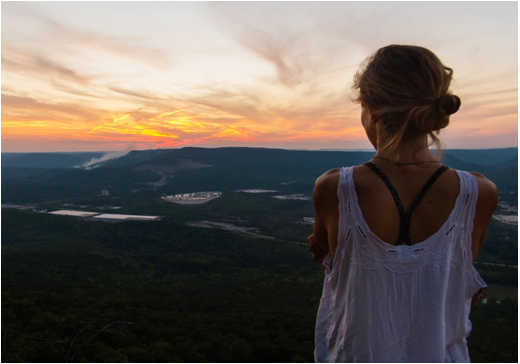 Hikers in particular can choose from a wide variety of scenic trails to find some stunning vistas of the both the city and the Cumberland Plateau. But isn’t the view better when you’ve really earned it? For serious hikers, the area around Chattanooga is filled with challenging terrain that will both test your endurance and give you access to some of the most beautiful country around. Are you up to the test? 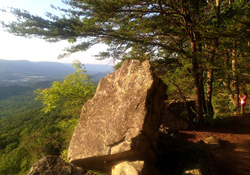 Here are five of the toughest hikes in Chattanooga for you to conquer. 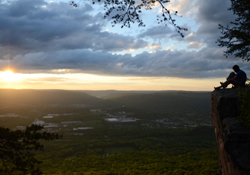 Lookout Mountain rises above Chattanooga and serves as one of the area’s most popular destination for both hiking and simply enjoying scenic vistas of the city and the Tennessee River. But for serious hikers, the 11-mile trek that starts near the entrance to the Reflection Riding Arboretum and Nature Center is one of the area’s best. Don’t let the name fool you, but you’ll start this hike on the Kiddie Trail, which makes a short but steep climb to the Skyuka Trail. That runs south along the forested slopes to Skyuka Spring, one of the most beautiful places on the mountain. 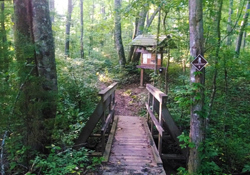 When you reach the overlook to the spring, continue on the John Smartt Trail as it ascends two miles to the Bluff Trail. Stay on the main trail as it rolls along the base of the bluff for two and half miles offering beautiful views of the valley below. Pass the left Gum Springs Trailhead and take the next right trail and climb up to Sunset Rock to take in the views. The Cloudland Connector Trail is relatively flat, but long, making it perfect for someone looking for an epic hike without a lot of climbing. The trail is in excellent condition and winds through crests and creek gorges along the mountain plateau. While there is no aspect of the scenery that stands out specifically, the entire trail provides well-maintained, beautiful wooded surroundings. 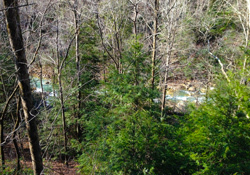 Most people begin at Cloudland Canyon State Park, with the 5.5-mile section of the trail called Price Branch. The calming sound of flowing streams and the sight of consistently wooded scenery make this a very relaxing hike. This 12-mile section of the Cumberland Trail features abandoned mines, views of deep valleys, gorges, and high bluffs—plus plenty of climbing over rock and wooden steps. It’s a challenging segment that passes through three major watersheds, and you’ll find sections that range from easy to steep and technical. From the parking area at Hotwater Road/Sluder Lane, the trail descends quickly to cross Little Soddy Creek. There are several signs noting the history of the area, as well as a yellow blazed historic loop trail. Take this yellow trail as it climbs steeply out of the valley toward Hotwater Road. After crossing the road (no parking is available here), you&apos;ll climb to high on the ridge, around the point of the mountain, and finally back into the Deep Creek Gorge. The trails on the west side of Lookout Mountain, especially the Bluff Trail, offer some of the best trail running and hiking in the southeast. The 10-mile Big Daddy Loop, which is comprised of seven different trails, features fantastic views of the valley&apos;s rolling hills flanked by Sand and Raccoon Mountains. 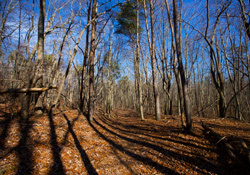 A popular route for trail runners, this loop is best during late afternoon, when the lighting is at its most beautiful. Just minutes from downtown at the Chickamauga and Chattanooga National Military Park, the trailhead is located at Cravens House, an historic structure with fascinating ties to the Civil War. Here’s another challenging section of the Cumberland Trail—a 6-mile (round trip) out-and-back route that requires quite a bit of climbing. You’ll travel up and down gorges and across swinging bridges under beautiful tree cover on this trail, which is about 10 miles from downtown Chattanooga. It offers hikers a wide variety of terrain, from the very steep to a relatively flat ridge with some rolling hills along the way. Finish up at Mushroom Rock, an impressive geological formation that really does look like a mushroom.